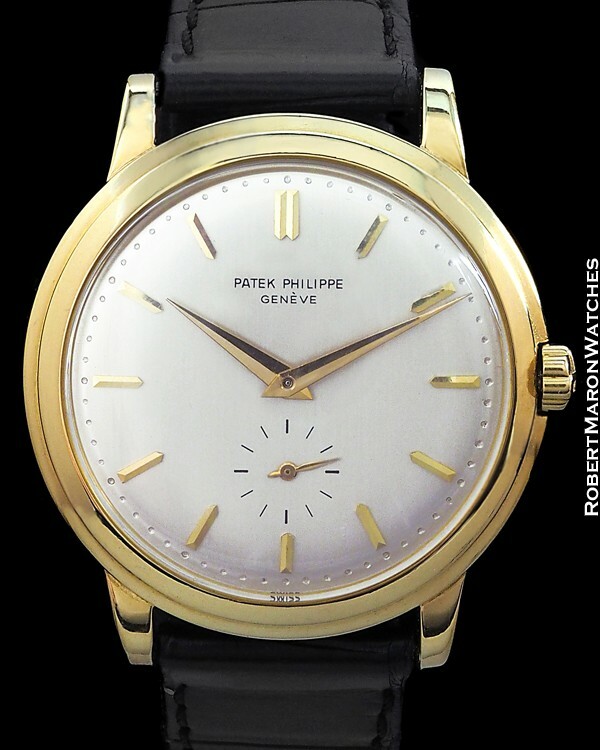 The Patek Philippe 2552 Calatrava is one of only a handful of perfect watches. Everything about the “Disco Volante”, which means “flying disc” in Italian, is masterfully executed. And then Patek throws us a curveball by pairing the automatic movement with subsidiary seconds dial. This watch is in outstanding condition, too, and our readers know that I think dauphine hands are a little slice of horological heaven! Original case is 18k yellow gold with 36mm diameter and 9.9mm thick. Case also features a large crown with the back to back “PP” Patek logo from the 1950s. Crystal is domed acrylic. Case back is a screw back, which was an early and successful pass at significantly reducing dirt, humidity and water intrusion into the case. Lugs curve downward. Bezel is two-tiered. Original dial is silvered with brush finish and with applied golden hour markers and dauphine hands. The minute track is embossed. Subsidiary seconds chapter at 6 o’clock, which again is a rarity for an automatic movement. Original movement is the automatic winding Patek Philippe Caliber 12-600 AT and is in perfect condition. Movement features a beautifully decorated and massive 18k winding rotor, 30 jewels, and is stamped with the Geneva Seal and is adjusted to 5 positions, heat, cold and isochronism. Watch is on new alligator strap.